JDS is now All About Color! We have added new candle and favor ink and ribbon colors to our personalized unity candles and favors. When you're looking to add a special touch to your wedding, include a personalized unity candle and personalized wedding favors in your celebration plans. These heirloom-quality, personalized unity candles are hand-printed (not a cheap sticker) and polished resulting in a personalized wedding candle that will be cherished on your wedding day and keepsake to be passed down for generations. Our personalized wedding favors are a unique way for your guests to remember your special day. 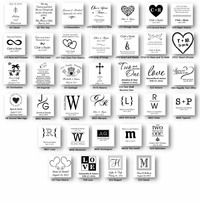 We print your names, wedding date and image of your choice onto one of our favors. #1 Unity Candle of the Year! Keep it Fresh with 20 new Candle Images!